Paul Fenton continues to make moves. With the Feb. 25 trade deadline approaching — and the Minnesota Wild in the midst of a 1-6-3 slump — the general manager made a significant change to his roster, sending longtime center Charlie Coyle to Boston in a trade for youngster Ryan Donato and a conditional fifth-round pick. The Wild made the trade official Wednesday night. Donato, like Coyle, can play both center and wing. The 22-year-old made his debut last season for Boston and has piled up 18 points in 46 career NHL games. Donato has struggled a bit in his first full NHL season. He tallied just six goals and three assists in 34 games and was sent to the AHL twice, most recently Jan. 17. In his latest stint with Providence, Boston’s AHL affiliate, Donato has scored seven goals and racked up 12 points in 18 contests. Donato, who starred at Harvard from 2015-18, played alongside Wild forward Jordan Greenway for Team USA in the 2018 Winter Olympics. The Wild acquired Coyle in a 2011 trade that sent Brent Burns and a 2012 second-round pick packing to San Jose in exchange for Coyle, Devin Setoguchi and 2011 first-round pick. Coyle made his NHL debut with the Wild in 2013 at the age of 20. Since then, he’s played 479 games for Minnesota and tallied 91 goals and 151 assists. Coyle had his best seasons after signing a five-year contract extension worth $16 million in 2014. His stock was on the rise after a 21-goal campaign in 2015-16, followed by a career-best 56 points the next year. But his play has been criticized in the last two seasons, as he’s logged 21 goals over that span (126 games). 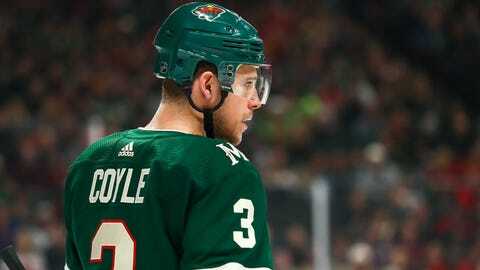 Coyle will become an unrestricted free agent after the 2019-20 season.